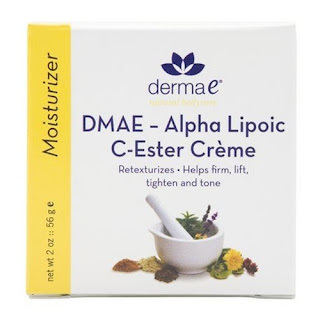 Widely-acclaimed DMAE and alpha lipoic acid are combined with C-Ester in this rich moisturizing formula that both hydrates your skin and improves its elasticity. Gravity-defying DMAE reduces facial sag and firms skin. Researchers report that it has improved skin hydration and tone, lip shape and fullness, and reduced the appearance of lines and wrinkles. Alpha lipoic acid, the universal antioxidant, protects both water and fat soluble cell structures from free radical damage, while C-Ester stimulates the production of collagen, essential for skin tone and elasticity. Enriched with additional vitamins and botanicals to nourish and hydrate your skin, derma e's complete line of DMAE products is formulated to improve skin tone and reduce wrinkles. Contains 1% of alpha lipoic acid.